Surprise! 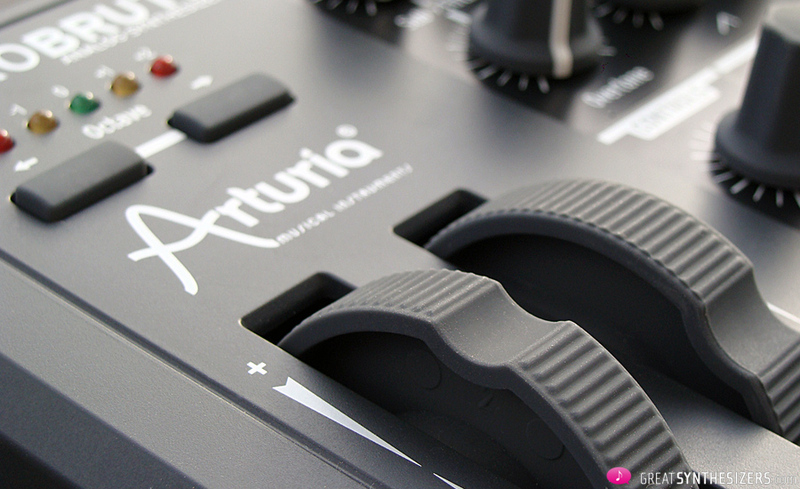 After the success of the MiniBrute synthesizer, Arturia has delved further into the microcosmos. 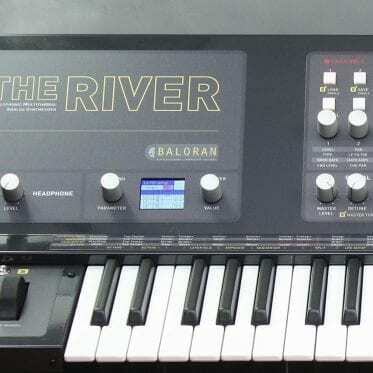 We all expected a real “Brute” synthesizer, a full-blown version of the “mini” with 4 octaves, 4-voice polyphony, memory and some extra controls (such as a ribbon controller). 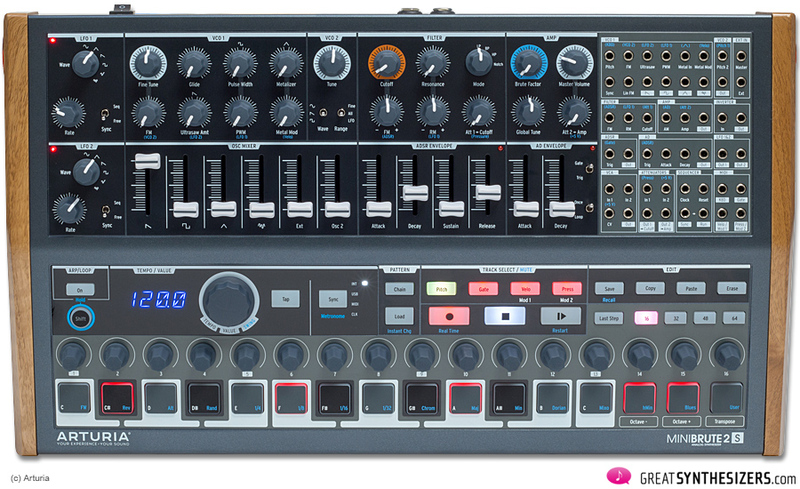 But we had it all wrong – Arturia has released the MicroBrute. The real surprise, however, is that the tiny MicroBrute (the dwarf) is a fantastic musical instrument. The concept behind this latest Arturia offspring is clever and flexible, thanks to its cute CV-department, together with MIDI and USB. 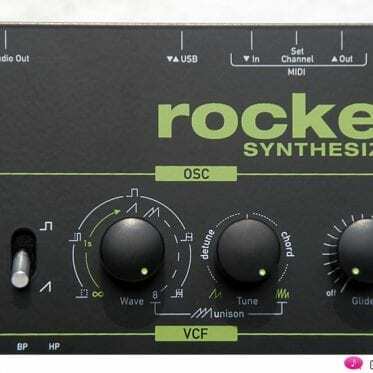 It’s a fun instrument, a magic box par excellence, a synthesizer for sound engineers and all-round musicians. At first, its size would seem to nudge the MicroBute into a certain corner. Into a corner where it does NOT belong. Its mini-keys might lead you to think that this is a toy! So serious keyboard players could hold their noses, smile politely (or not), turn around and go on their way. Whoever has learned to play the piano – whether on an acoustic or on an electric instrument – is NOT used to mini-sized keys. Not only the keys are of smaller dimension, the user panel has also been shrunk. Fewer knobs and faders (the second ADSR is missing) are what’s left after a drastic Arturia diet. But wait! There are some (great) improvements, too. A sequencer and a tiny CV-panel have been added. Well-placed, by the way. Direct access from above is so much easier than having to reach around the instrument. MicroBrute gets a golden star for this …! Wrong the one who might think a new CV-panel means fewer jacks in the back. 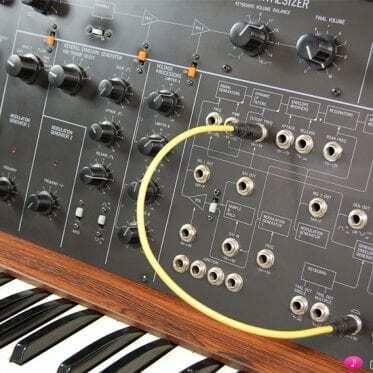 You’ll find MIDI (IN), USB (sending data IN/OUT), audio-in and -out and further CV/Gate connections back there. There’s also a recessed FINE TUNE knob which allows delicate adjustments of the oscillator pitch (+/- 2 semitones). A feature which would have stood the Waldorf Rocket well, by the way. So there are really two (!) MicroBrutes under that imaginary Christmas tree, standing side by side, playing simultaneously with just a small amount of beating … the auditory result is in any case fantastic – a massive 2-VCO sound which far outdoes that of their bigger brother MiniBrute. Or, if you like, you can give yourself just one MicroBrute and record the same track twice, slight varying the fine tuning in the second track. 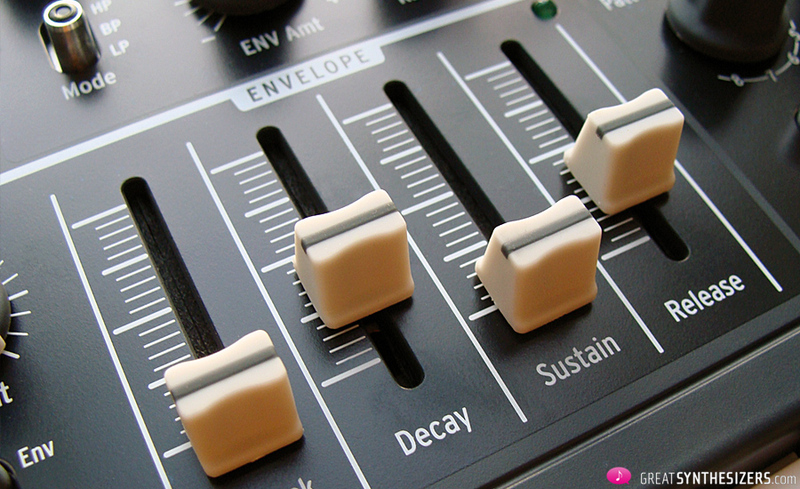 The results will be the same … thick analog sounds with beats of the finest sort. A MicroBrute monster (angle? ), if you like. Not only the sound, the hardware too is “gigantic” in this dwarf. Good, solid knobs (well, to be honest, one single knob – the Sequencer pattern knob – did wiggle just a little), an impeccable fit for the silver switches (even if the quality of the vintage Roland synthesizers like SH-1/2/5/7/09 has never been beaten – but this is a thing of the past, as we all know). The two rubber wheels are solidly made and a delight to use. The 4 envelope slider work precisely and seem to be of very good quality. Even the chassis is state of the art. The MicroBrute is ! heavy. Very massive, very stable – everything a musician could wish for. 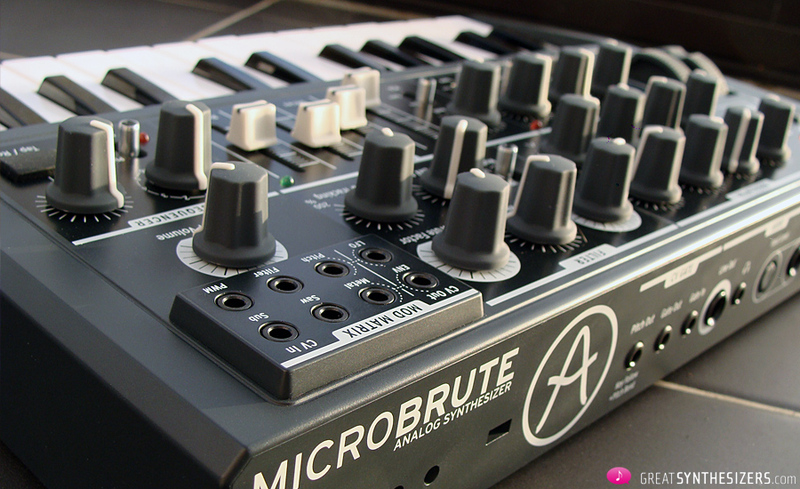 As with the MiniBrute, the MicroBrute is a product of impressive team work. Let’s take a look at performance. What’s nicer to have in an analog synth than having a little playing assistance support your creativity? The sequencer is a real asset. Simple but brilliant. The 8 on-board presets (patterns) can be overwritten. Just play a melody, press rest (if you want some rhythmical variations) … and there you go. RUN starts the melody, which can be transposed over the whole length of the keyboard. If you add some glide (and increase the filter resonance, for example), the MicroBute comes close to that groovy Roland TB-303 acid sound. 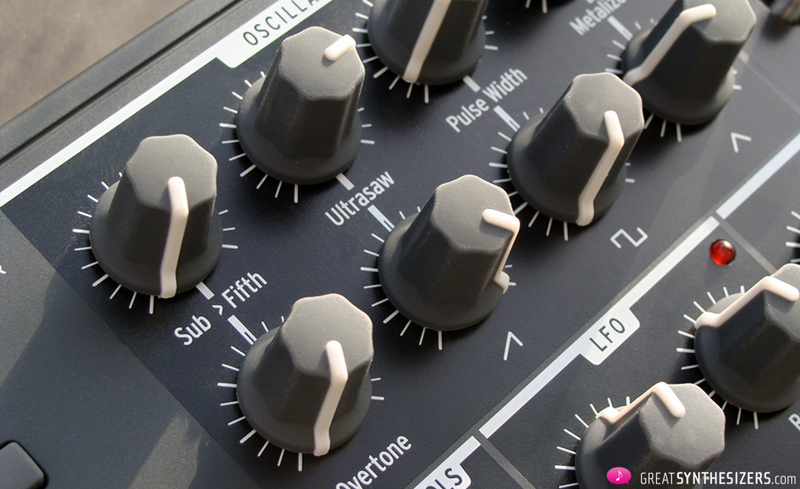 Another great feature is the LFO which can be synced to MIDI and to the sequencer. In FREE mode it runs from 0.1 to 200 Hz (in our opinion an even lower speed would be desirable). In SEQ mode it runs parallel to the sequencer, in which case you can choose between several fixed time divisions of the incoming sequencer clock (4 measures, 2 measures, 1 measure, ½ note, ¼ note). 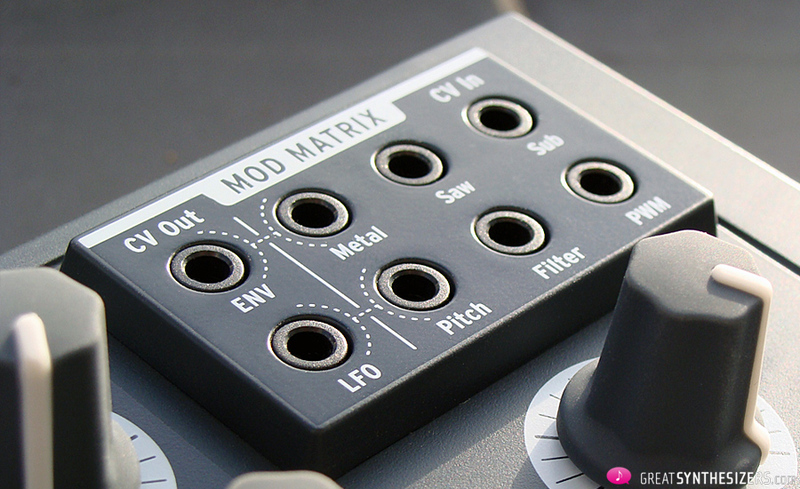 The LFO is also available in the modulation matrix, where it can be routed to various destinations. Imagine the sequencer running a stunning pattern while the LFO – which is tied to it – modulates the METALIZER function or PWM or the FILTER. 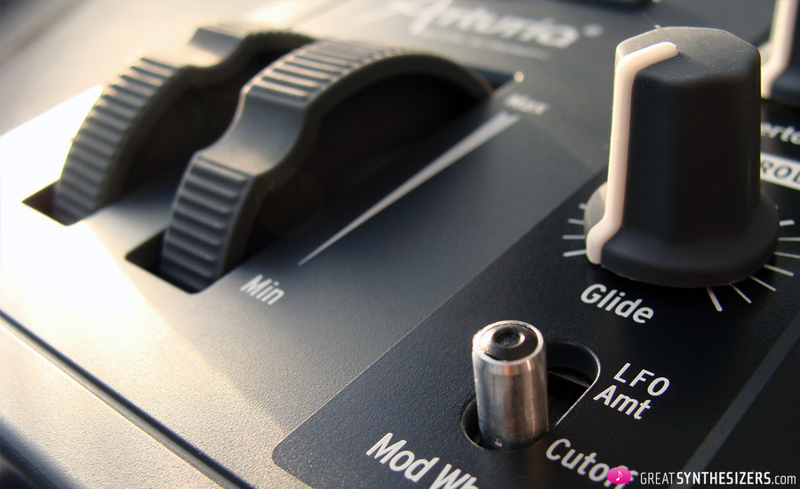 Now switch the MOD WHEEL destination to CUTOFF and manipulate the filter with your left hand, like a DJ turning the tables. Finally you add some BRUTE factor (the filter starts to overdrive), give the running pattern’s peak notes some accents (filter KBD tracking to its maximum) and start fading in and out the sub-oscillator … welcome to analog heaven! Flexibility in performance is – along with its definitive sounds – the real advantage MicroBrute has to offer. Its so well constructed and completely thought-out that nothing – almost nothing – will be missed. 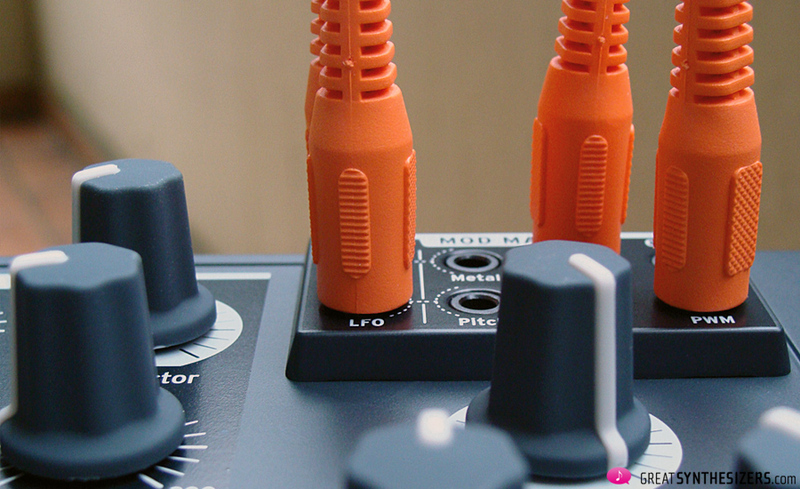 Every existing function, every knob contributes to a climate of ideal performance potential. 2. The multimode filter offers lowpass, bandpass and highpass mode. 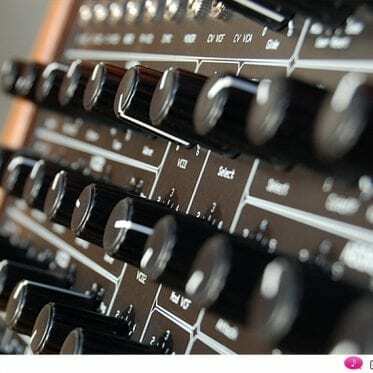 It can easily go into self-resonance, turning the sound into something dirty, aggressive. Keyboard tracking can be adjusted from 0 to 200 % (!) and the envelope amount can be positive or negative. Finally, there’s the BRUTE factor, which distorts the overall sound. 3. The LFO is quite good. Its speed ranges from 0.1 Hz to 200 Hz. Sad to say, it only has rectangular, sawtooth and triangular waveform (sample & hold would have been great here). 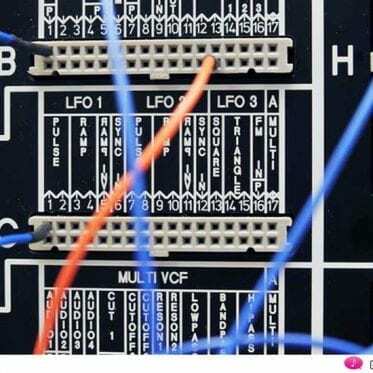 Nevertheless, the LFO is very useful! And it can be synchronized with the sequencer … what elso do you wish for? First, there’s the missing noise. This is, naturally, important in connection with percussive sounds and experimental stuff. Our solution: take the noise of an external module (a small modular rack shouldn’t be too far away in any case if you want them to interact!) and shove the noise through the AUDIO IN of the MicroBrute. Then again, purists will probably miss the second envelope. You would be right here, of course, but a glance at the compact MicroBrute leaves no doubt that there’s just no room for a second envelope. 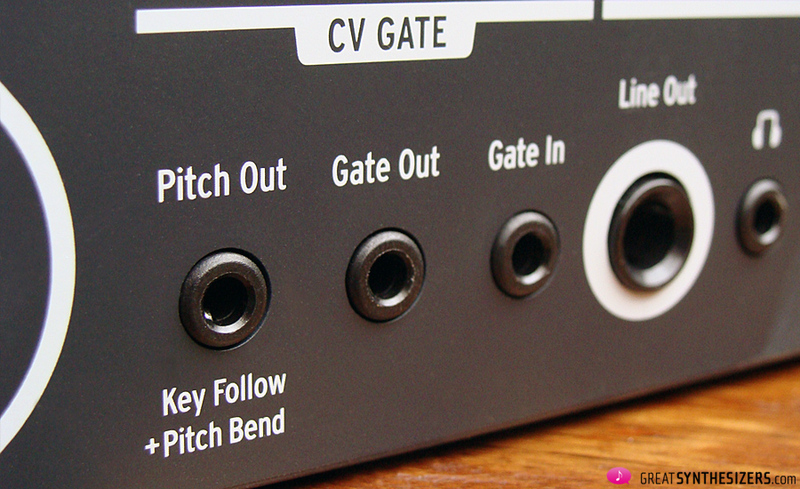 By the way: the VCA can be switched to GATE. This frees up the envelope for filter use only. The Connection software is unbelievably important. 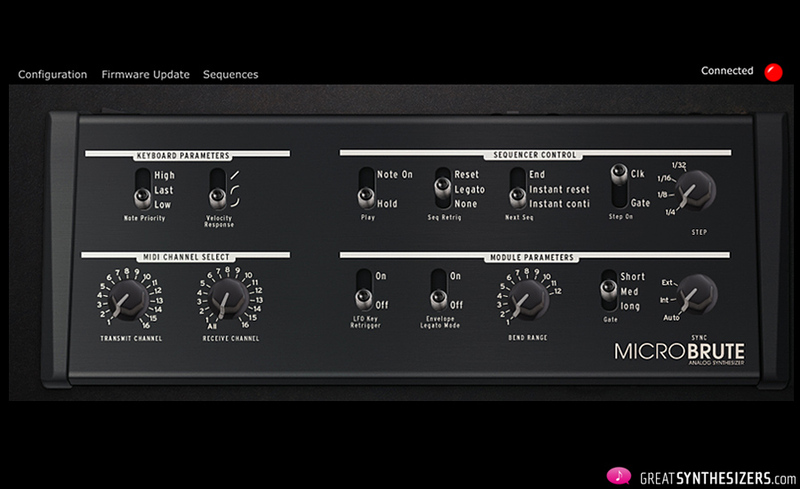 Above all, it enables certain adjustments that you will need again and again to be permanently registered in the MicroBrute. 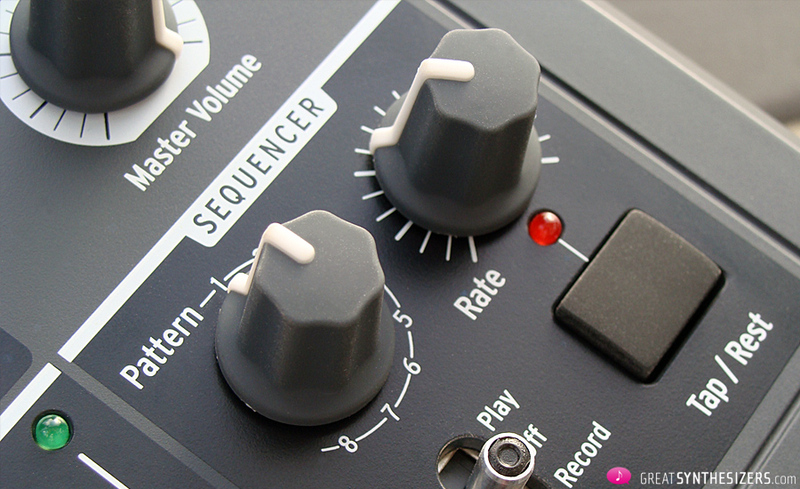 Let’s say you use the sequencer regularly. First, you record a pattern (done in a few seconds) and off you go … it’s self-evident you can transpose the pattern in realtime, BUT that means holding down the key! This is where you could wish for a HOLD function … which is accessible via the MicroBrute Connection software we’re talking about. Switch the virtual sequencer PLAY mode switch to HOLD, and that’s it. The new function is now integrated into the MicroBrute’s brain, you don’t need to connect the software anymore unless you want to remove HOLD again. 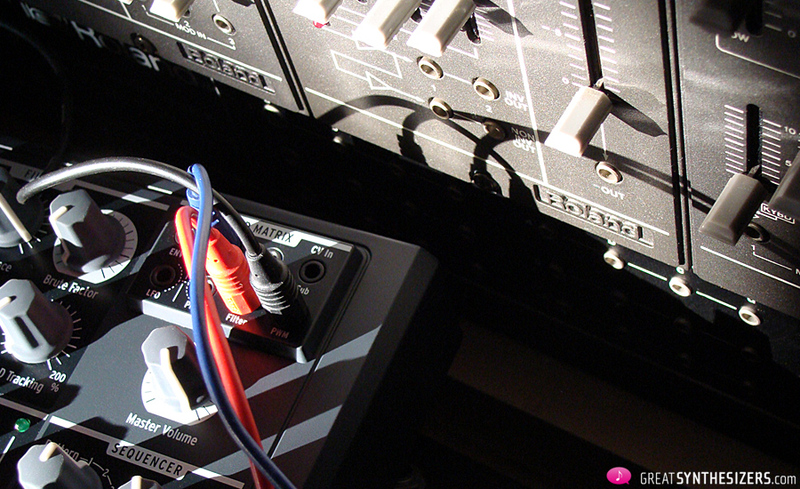 Another useful aspect of the MicroBrute Connection is being able to set the sequencer clock to (external) gate. This is tremendously important, we really had hoped Arturia would include this synchronization possibility. So, good news … analog clock control of the sequencer is possible (along with MIDI clock, of course). You can also set pitch bend range to any number between 1 (semi-tone) and 12 (octave)! That’s it in a nutshell. The MicroBrute Connection software is fantastic… free, easy to use and a real help to the musician. … it may be said that we live in a near-to-perfect electronic heaven these days. 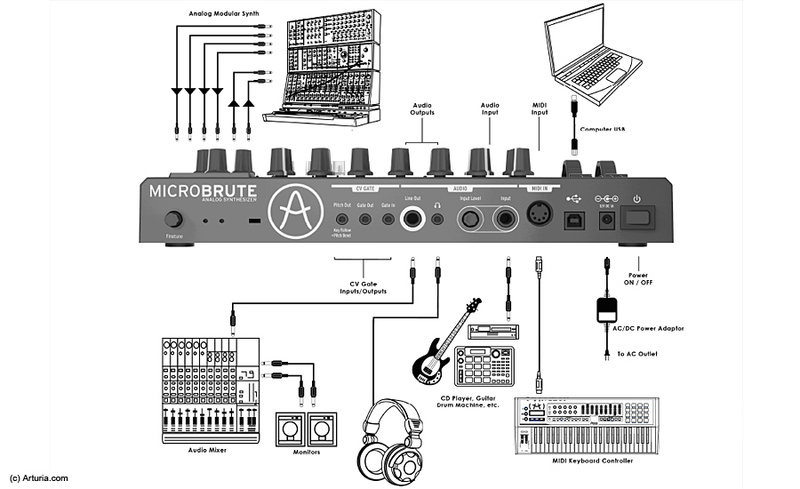 Here’s your proof: the MicroBrute. Arturia has succeeded in producing a complete, excellently sounding analog synth with step-sequencer and CV-panel for an unbelievable 329 Euros (or so). Just a few years ago, we wouldn’t have even dreamed of this price performance. Now, whether those mini-keys are a bother is something everybody has to decide for himself. 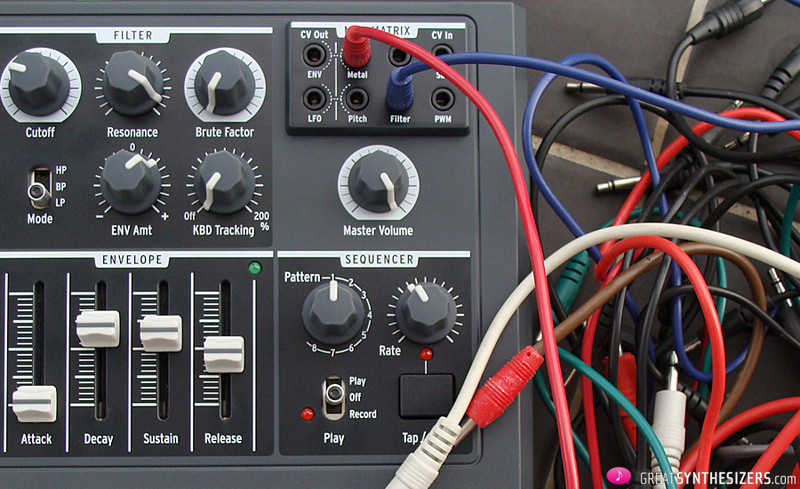 Making music on a MicroBrute is in any case uncomplicated, effective and enjoyable. It will tease out the creative YOU. And this will change your musical perspective. 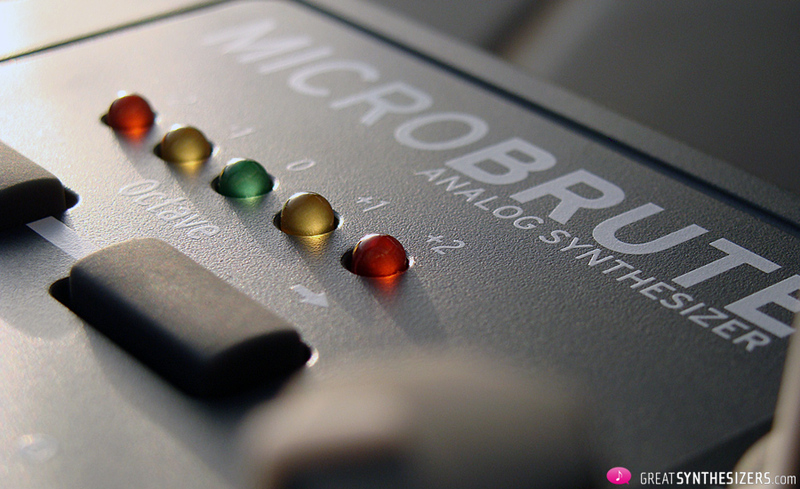 You might even come to the conclusion that the MicroBrute – without those mini-keys – feels big and clumsy. It is what it is, and what it is is perfect. And in the end, you probably won’t want to change anything. 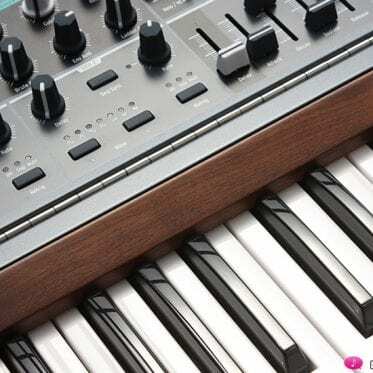 Yves Usson recommends (Facebook) the use of the MiniBrute together with the MicroBrute. Whereby the MiniBrute would contribute noise and the velocity-sensitive keyboard. Or – recommendation of the day! – you use 2 MicroBrutes placed next to eacj other. 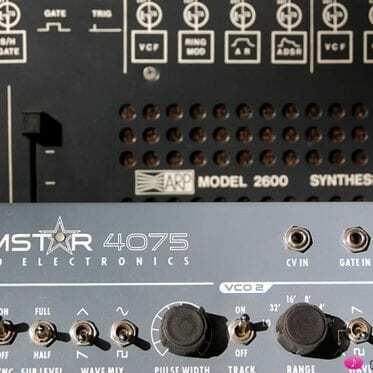 Giving you a massive 2-VCO system with 2 independent sequencers and 2 independent CV-panels. Your money bags are a little threadbare? 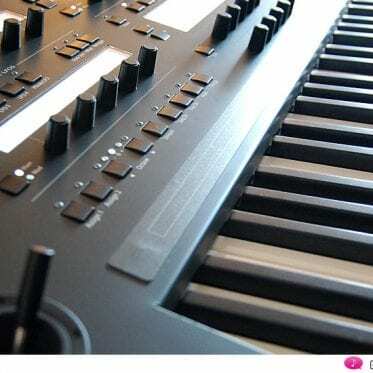 Then stick with ONE MicroBrute, pairing it with any other instrument you already own (such as the Moog Sub Phatty, the Doepfer Dark Energy II, somthing of that sort). Or – and this is almost a MUST – you add a small modular rack to your MicroBrute, enabling the little dwarf to show what it really can do. As usual, we offer you generously from our soundfiles. 40 minutes of audio material should give you a good idea of the acoustic possibilities of the instrument. We’ve stuck to the MicroBrute for all of our samples, with the exception of “Demo 2” (a Kawai K4 adds some pad sounds), “Slow Pad” (a Hohner Rhythm 80 drum computer contributes a somewhat nostalgic beat) and “Too Soft” (the Crumar Bit-99 is responsible for those soooooft strings in the background). Everything else: MICROBRUTE PURE, so to speak. 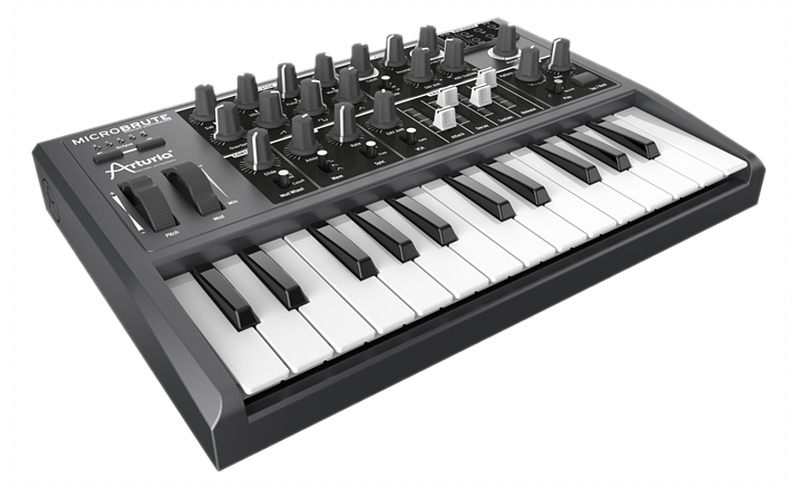 The MicroBrute sounds great, it’s a user-friendly and well thought-through analog synthesizer. We recommend it. 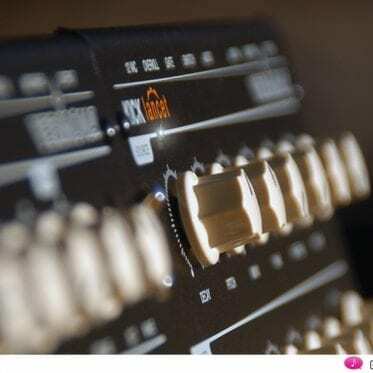 Update 01/2018: Arturia releases MiniBrute 2 and MiniBrute 2S. 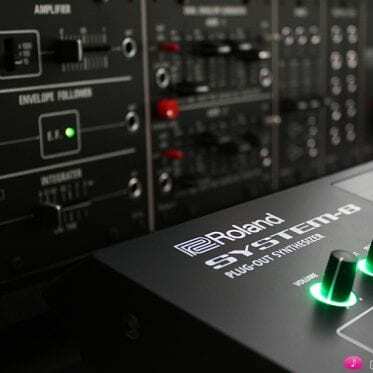 These synthesizers are a mixture of MiniBrute, MatrixBrute and DrumBrute, replacing the original MiniBrute and MicroBrute. They are slightly more expensive – 649 USD / Euros – but come with a huge patch field and many other cool features.